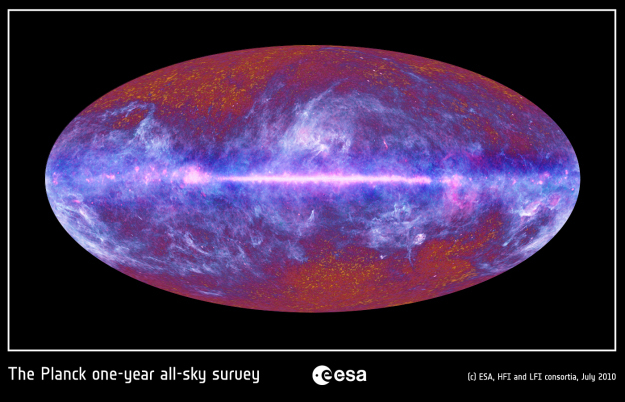 This multi-colour all-sky image of the microwave sky has been synthesized using data spanning the full frequency range of Planck, which covers the electromagnetic spectrum from 30 to 857 GHz. The grainy structure of the CMB, with its tiny temperature fluctuations reflecting the primordial density variations from which the cosmic web originated, is clearly visible in the high-latitude regions of the map, where the foreground contribution is not predominant. A vast portion of the sky, extending well above and below the galactic plane, is dominated by the diffuse emission from gas and dust in the Milky Way, which shines brightly at Planck's frequencies. While the galactic foreground hides the CMB signal from our view, it also highlights the extent of our Galaxy's large-scale structure and its emission properties. Although the two main components of the microwave sky appear to be separable only in certain areas, an optimal foreground removal over the entire sky is possible thanks to sophisticated image analysis techniques, which have been developed by the Planck scientific teams. These techniques rely on the observatory's unique frequency coverage and the unprecedented accuracy of its measurements. This image is derived from data collected by Planck during its first all-sky survey, and covers about 12 months of observations. Note: Because of the manner in which all the channels have been combined to produce this image, the colours no longer represent accurately the brightness at each frequency. The angular resolution of this image has been reduced by a factor of around three from its sharpest rendition, to better match it to a typical viewing screen. For these and other reasons, this image is not suitable for scientific analysis.